Coal miners were frequently at danger from explosive mixtures of methane gas in the atmosphere of the mine. Its very important to provide adequate and safe light to enable miners to work underground. LED mining lamp is used to replace the traditional lamp beads as the luminescent body with high brightness LED light source, and cooperate with the mining lamp produced by lithium ion battery.Compared with the traditional lamp, this product has the advantages of small volume, light weight and efficient energy-saving lamp.The LED mining lamp can be used for all kinds of underground mining operations, tunnel operation, ocean operation, maintenance work, outdoor sports, hunting night fishing, expedition, soldiers' equipment, etc. 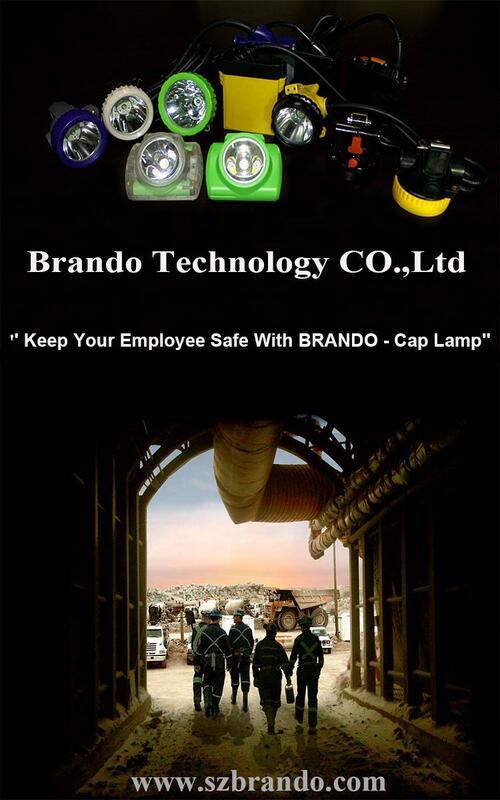 BRANDO provided a variety of miner lights, such as corded lamp, semi-corded lamp and cordless. * Cordless light weight only 120g. The lamp is included with a special charger, which does not need to be equipped with others charging equipment and maintenance workers. Also can be energized by smart phone's(USB cable). The charging cost is only one sixth of the traditional one. The lamp has the function of overvoltage, overcurrent, overdischarge automatic protection, safety and explosion-proof. The lamp case is made of engineering plastics and bullet-proof glass, which can work in all kinds of harsh environments.